This is the ultimate comfort food. Lightly spicy and with a rich, creamy texture – yet, it’s dairy free! A low GI, hi-fibre soup-er-bowl! 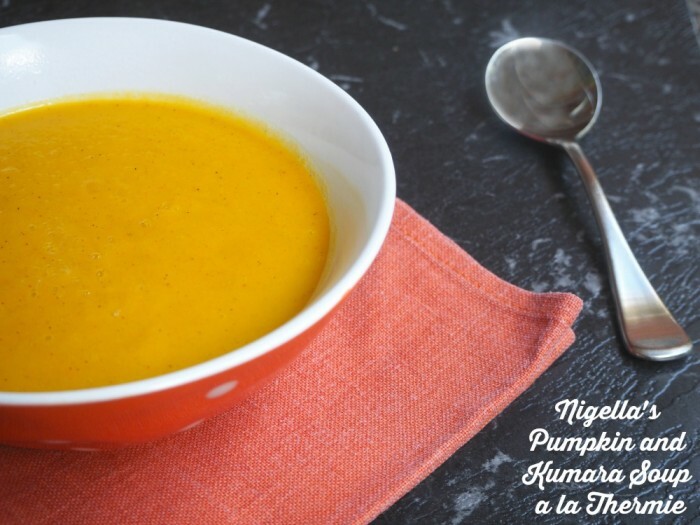 If you don’t have a Thermomix, click here for Soup Express in a pan! Place onion into TM bowl and chop for 3 seconds on speed 5. Add oil and sauté for 2 minutes at 100C on speed 1. Add spices to bowl and cook for 1 minute at 100C on speed 1 to release the flavours. Add pumpkin and sweet potato. Chop for 15 seconds on speed 7. Add stock and cook for 20 minutes at 100C on speed 1. Blend for 15-20 seconds by slowly going from speed 1 to speed 9. Pour the blended soup into bowls. Garnish with some swirls of buttermilk or a dollop of sour cream if you like.